Yyou may be wondering why I was watching an anime that I make so many negative comments about (especially about the heroes, that I don't care much for). Well the "rat episode" is an example of what made the show bearable (apart from the cool villains, that is) and even very fun sometimes. This is the episode that got me thinking "What the he** are they smoking in the writing team?" The episode starts with Luna being chased by countless cats. 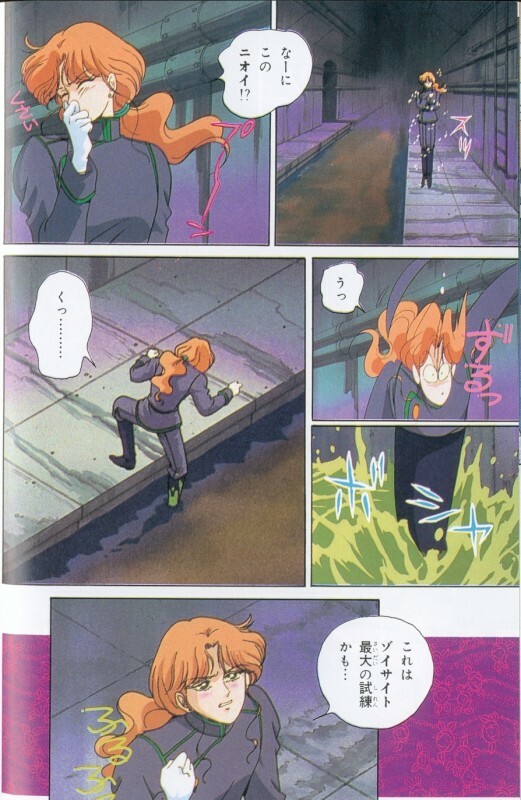 When she can no longer escape, she's rescued by (with the music of Tuxedo Kamen's interventions)... a fishbone sent from a roof, that stops the cats, much Tuxedo Kamen uses his roses. But instead of a handsome black cat appearing, it's a huge ugly grey cat that is on the rooftop. 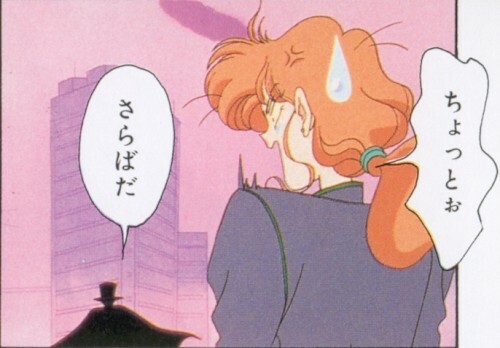 Anyway, the cats leave Luna, and her savior seems to have a bit of a cat-crush on her (this is a direct inner parody of the Usagi / Mamoru love story...). Meanwhile, Zoisite uses a spell to see who is the bearer of the next Nijizuishou. His black crystal show him a vision of the cat's owner, Scarlett, holding her ugly cat (named Rhett Butler, yes...) in her arms. 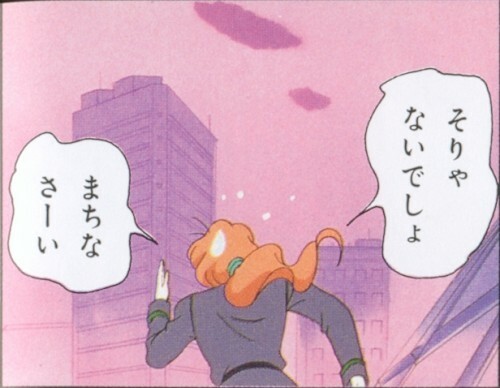 So of course he goes looking for them, without knowing that the Senshi (in civilian clothes) are around. The cat runs away, and Zoi performs his crystal-revealing spell on the girl, to no effect. He then realizes that it the demon he's looking for is in the *cat*, not the girl. 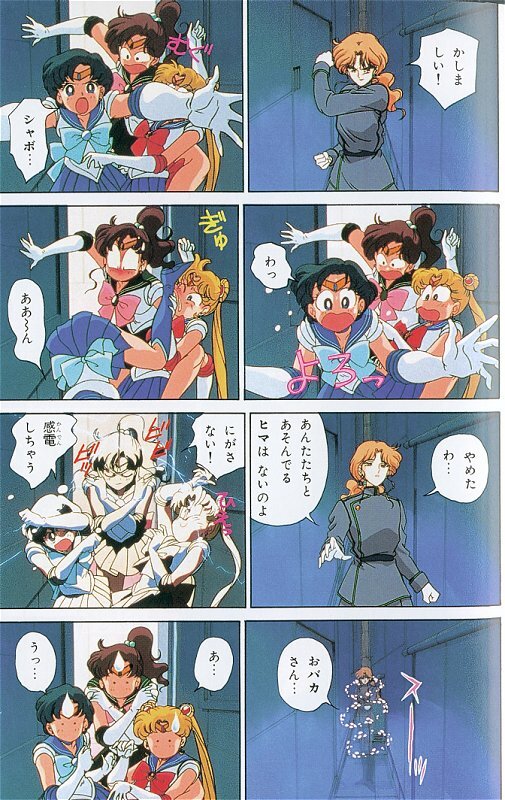 But the Senshi have put on their outfit and find him in the narrow alley. Upon which Zoisite decides that it's not worth fighting them, especially as his prey has left, and he teleports, leaving them sweat-dropping. Locating the cat with magic, he appears not far from him... Except, it's in sewers. 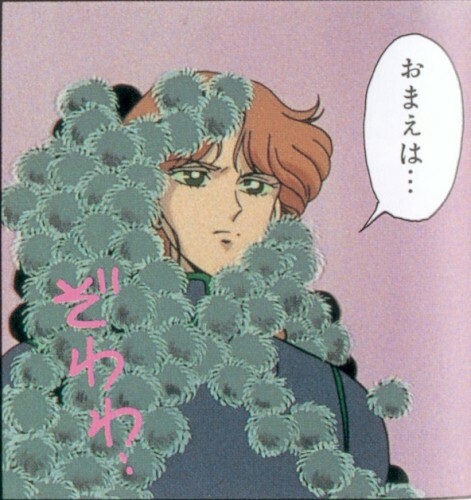 What an ugly situation for someone as delicate as Zoisite. While looking in a pipe... "Eh? Warm soft wall?... Kyaaaa! Rats!" A pursuit ensues : Luna and Rhett are chased by Zoisite, who is chased by thousands of rats. Zoisite "extracts" the purple Nijizuishou from Rhett, which turns it into a giant wild-cat looking demon (for once, the demon shape is more beautiful than the "normal" one...). The demon yet manages to keep enough of his own feelings for Luna not to cause damages or to hurt her. 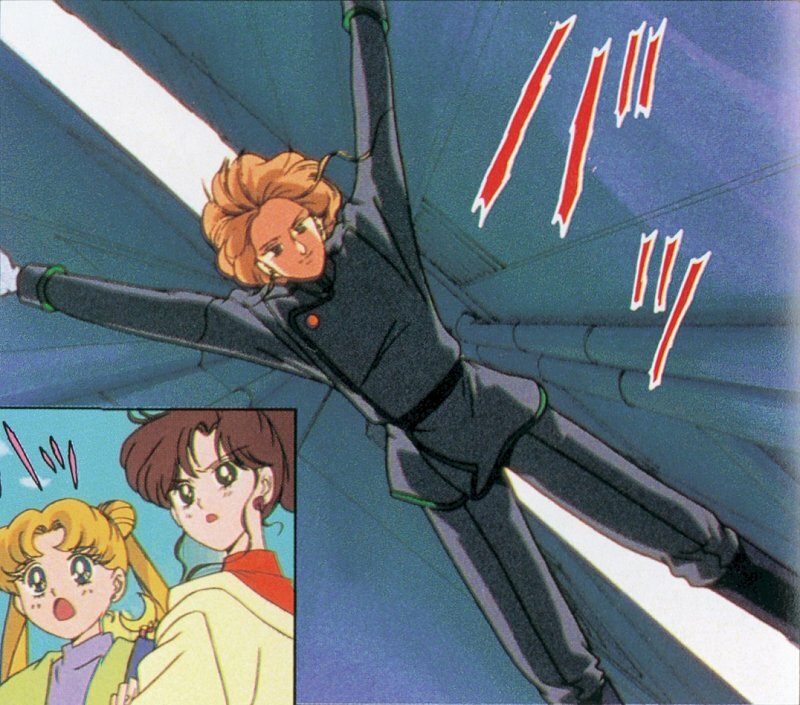 It gives enough time to the rest of the Senshi to arrive, and Sailor Moon can "heal" him with her Moon Stick. Yep. Bad day. Bad, bad day for Zoi. And probably the most hilarious episode of the show.